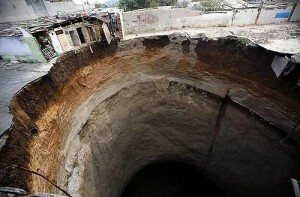 Guatamala – Tropical Storm Agatha: A massive hole, caused by rains from the tropical storm Agatha,� appeared in Guatemala City. The storm has killed at least 146 people since the weekend as emergency workers struggled to dig bodies out of the mud. At least 146 people have been killed since heavy rains from the first named tropical storm of 2010 hit Central America. More than 94,000 people have been evacuated as the storm buried homes under mud, swept away a highway bridge near Guatemala City and opened up giant sinkholes in the capital. 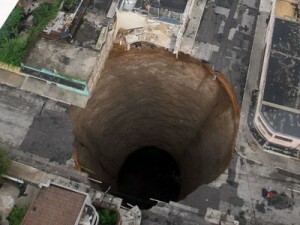 Just what is a sinkhole you may ask? It is just what it sounds like, when the topsoil and bedrock collapses due to water erosion below and the pile literally sinks into the earth, leaving a big hole where there was once level solid ground. And while this sounds as if it is one of those unlikely events, almost bordering on urban myth, it happens with alarming frequency, anywhere from unpopulated wilderness to densely populated urban centres. More commonly in cities, sinkholes occur due to water main breaks or sewer collapses when old pipes give way. 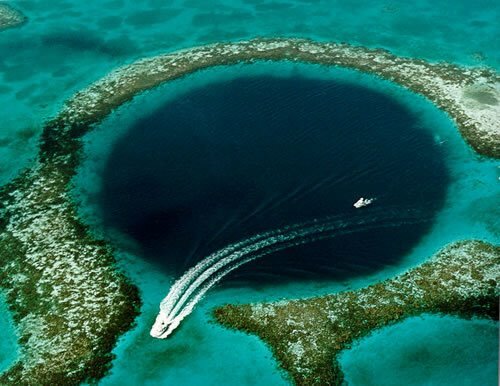 Sinkholes on land have been used for centuries as disposal sites for various forms of waste, while underwater sinkholes, such as those that form in coral reefs and islands that collapse to enormous depths, are known as Blue Holes and often become popular diving spots. 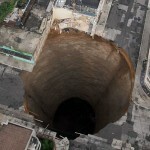 The size and depth of some sinkholes is astounding – from several hundred metres deep to over 100 km across – the most impressive of which are presented in this list of the world’s biggest sinkholes. 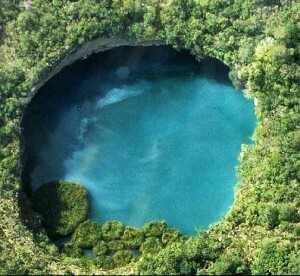 Geologists say this 40 meter wide, 20 meter deep water-hole was created when a limestone cavern collapsed, but the locals say a piece of the moon fell from the sky and made the hole. There is a park created in the area around the sinkhole, complete with change rooms so visitors can swim and get into the water if they want to. 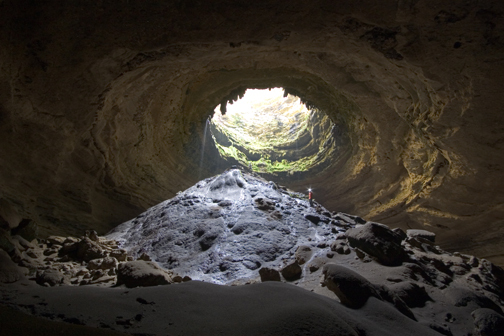 The 400-foot deep Devil�s Sinkhole in Texas was first discovered by Anglo settlers in 1867.� Today, as a registered National Natural Landmark, the area is protected area by the state and is a well recognized tourism destination, as well as the summer home to as many as four million� Mexican Free-tailed Bats. Apparently the bats put on quite a show in the evenings when they leave the cave to forage, and tourists go for this show (Evening Bat Tours) as much as for the wonder of the sink hole itself. On June 15, 1994 a 15-story-deep sinkhole opened up in an 80 million-ton pile of phosphogypsum waste — known as a gypsum stack. 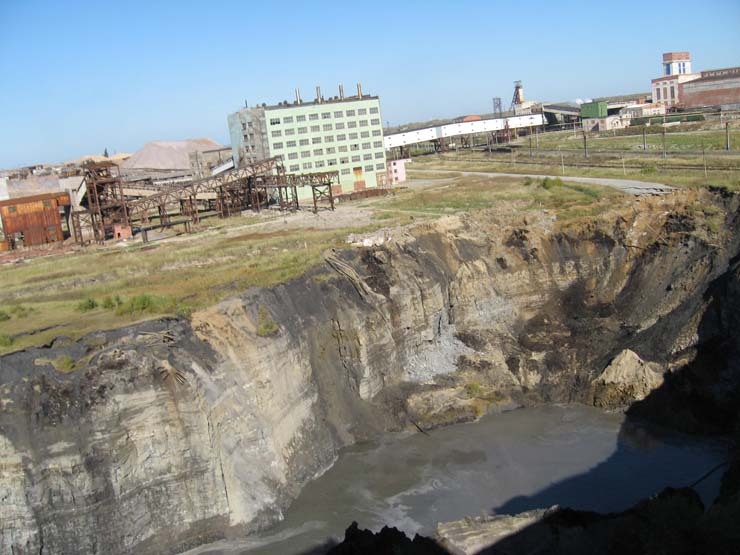 The hole displaced 2 million cubic feet of earth, enough to swallow 400 railroad boxcars. 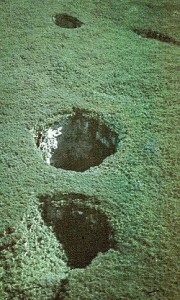 This hole was nicknamed “Journey to the Center of the Earth” – Disney World’s newest attraction – by the Florida locals. Yet this was really no laughing matter; the cave-in dumped 4 million to 6 million cubic feet of toxic and radioactive gypsum and waste water into the Florida aquifer, which provides 90 percent of the state’s drinking water. To their credit Agrico Gypsum voluntarily spent $ 6.8 million to plug the sinkhole and control the spread of contaminants in the ground water. 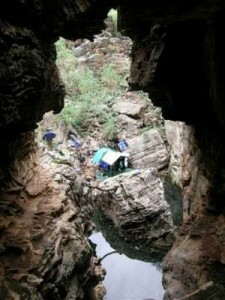 Located in South Africa, this underwater sinkhole is believed to be the third-deepest submerged freshwater cave (or sinkhole) in the world at approximately 270 metres deep. 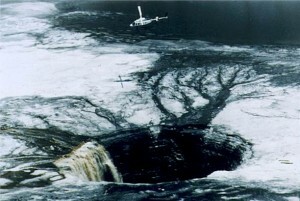 Diving explorations in this sinkhole have been made, the first in 1977, though given depths that often exceed 240 metres, this is a highly dangerous dive and several divers have died in the attempt. Zacat�n is the deepest water-filled sinkhole in the world and one of a group of five interconnected sinkholes, known as cenotes in Spanish, in northeastern Mexico. 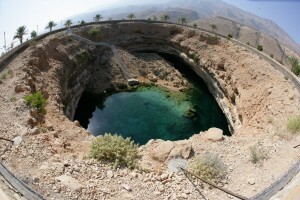 One theory states that the sinkholes of Zacat�n, measured at 335 metres deep (1,100 ft), formed in a way similar to Mammoth Hot Springs in Yellowstone, California – from the bottom up. Deep acidic water carved its way up through limestone, creating shafts to the surface. This sinkhole is on the tip-top of a high mountain peak. The Sarisari�ama tepui is a 2,350-metre high mountain in the Jaua-Sarisari�ama National Park at the far south-west of Bol�var State, Venezuela, near the border with Brazil. 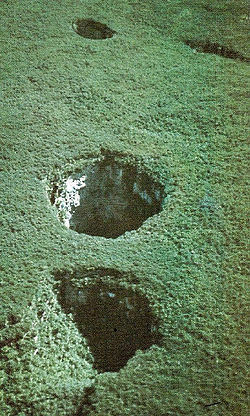 The most distinctive features of this tepui are its sinkholes, which were first brought to attention of modern scientists in 1961 by a pilot who saw them from the air, yet it was not until 1974 that the mountain summit was reached and the sinkholes could be investigated. Given the pristine state of the area and the opportunity to learn more about the ecology and geology, this region is not accessible by the general public � it is restricted to scientific endeavors only. The Great Blue Hole is a large underwater sinkhole off the coast of Belize. 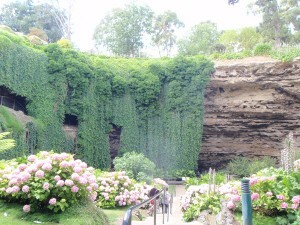 The hole is circular in shape, over 300 metres (984 ft) across and 125 metres (410 ft) deep. Great Blue was made famous by the famous French oceanographer Jacques Cousteau who declared it one of the top ten scuba diving sites in the world, and is today a popular spot amongst recreational scuba divers. The vast Qattara west of Cairo, Egypt is the world’s largest natural sinkhole, measuring 80km long, 120km wide and 133 metres deep. This dangerous, sludge-filled quicksand pit is unearthly in its appearance and shocking in its size. 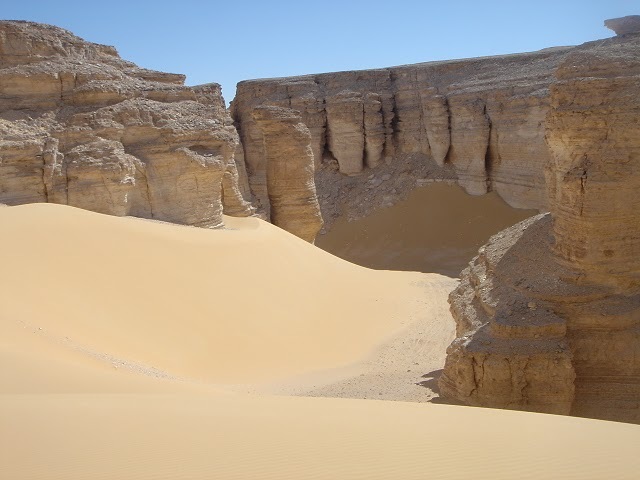 Egypt is home to a number of desert sinkholes, produced – incredibly – from the Sahara winds tearing into the salt beds down to the water table.